The book is a must for everyone interested in antique clocks; clock merchants, antique dealers, auctioneers, watch collectors, or just anyone wanting to know more about their inherited clock. The Book is a research in Georges-Frederic Roskopf and his work, a man whose invention has created wealth to hundreds of factories in Switzerland. 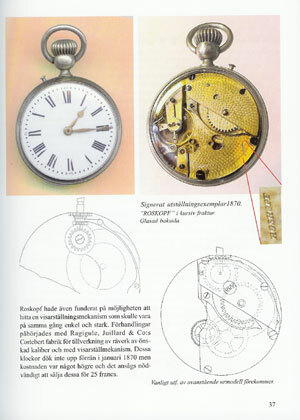 These factories have after 100 years grown to be Switzerland’s largest (Switzerland’s most exported watch) as a result of his invention and it gave thousands and thousands of people work. He and his relatives didn’t get any fruit of his work or take part in the fortunes it created. 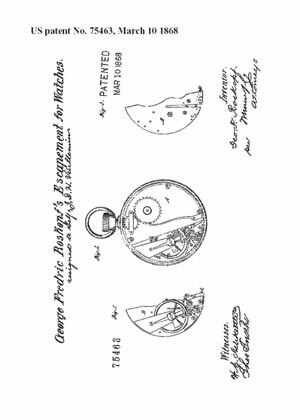 Many factories have improved the watches from time to time and many have benefited from Roskopf’s idea and bungled it by producing inferior watches in the name of competition and profit. 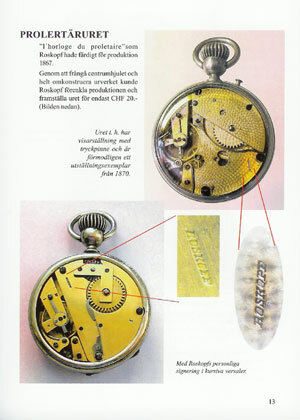 The serious manufacturers had realised the use of his invention and with advantage took the watch in their assortment. 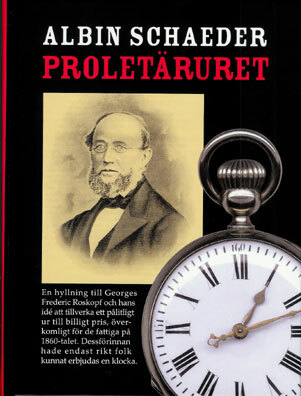 The Book is a late homage to Roskopf for his farsighted idea and philanthropy and his contribution to the watch history is worth all esteem. The numerous colour illustrations and the detailed descriptions provide an insight into the impact of Georges Frederic Roskopf’s invention. The book includes details of numerous company trademarks and more than 40 separate patents. The Roskopf exhibition – An interview (in French) with Jean-Miguel Piguet, Deputy Curator of the International Horology Museum in La Chaux-de-Fonds, Switzerland. La drôle de montre de Monsieur Roskopf – (The Strange Watch of Mr Roskopf) A book on the Roskopf exhibition in La Chaux-de-Fonds by Jean-Michel Piguet with contributions by Liliane Roskopf, Paul Van Rompay, Pierre-Yves Donzé and Karla Vanraepenbusch. Georges Frederic Roskopf – Wikipedia. 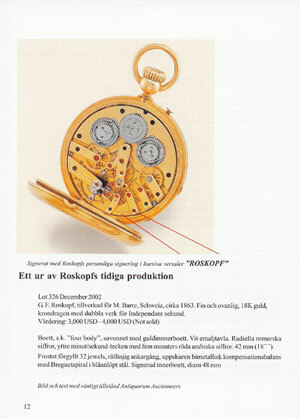 The Roskopf watch – it’s history, inventions and patents by Ulrich Bretscher. 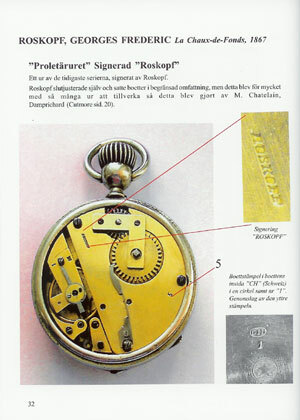 History and Design of the Roskopf Watch – by Eugene Buffat.